I was reading something the other day about the differences between entrepreneurs and solopreneurs. Basically, solopreneurs build a business based around their passion and are completely content with handling the workload on their own. Entrepreneurs, on the other hand, might build a WordPress business based around their passion, but would rather serve as the face of the company and manage a team that takes care of the work. For those of you who enjoy the day-to-day work of being a WordPress developer or designer, you’ll find this article interesting, but those who like to manage others will find it more actionable. While you may eventually need to outsource some of your responsibilities to others, this article is about scaling your business. And the only real way to achieve that is by building a strong team and support system around you. That said, you’re not an HR manager. So, what do you even know about hiring freelancers or employers for your WordPress business? The following guide will discuss the roles you need to fill, what to look for when hiring those positions, as well as how to evaluate applicants. What Type of Freelancers Do You Need to Hire for Your WordPress Business? You’ve heard the phrase, “Good help is hard to find.” That’s because it is. Trust me, I’ve been through this process before and it’s not pretty. It’s time consuming. It’s stressful. It’s incredibly risky, too, if you rush through it quickly. I like to think of it like a box of chocolates. You’re really excited about the possibilities within that box, but you could end up with some real duds if you don’t choose carefully. So, let’s take this step by step and make sure you’re ending up with the caramel-filled milk chocolate (or whatever your personal preference is) with every single new hire. By hiring professionals with experience in each of these key areas, you’ll be able to offload most of the key responsibilities involved in the website development process. At some point, you’ll probably need an accountant or project manager, but, for now, let’s focus on streamlining your workflow. Where Can You Find These Freelancers? When scaling a business, your best bet is to look for freelancers first. In my own experience with recruiting and hiring for a boutique agency, this was the path I took and found a lot of success in. This is probably because hiring freelancers enables you to take the time to find someone who is a great fit without having to spends months bogged down in the recruitment process and stuck without assistance in the meantime. I also like how you can get a good sense for how a potential employee will work out while they freelance. You can gauge their skill level, assess how dedicated they are to the job, establish a rapport with them, and even set a rhythm to the workload and see how well they match it. This isn’t something you can’t necessarily get by reading through a resume or looking at work samples. As a bonus, you can hire a number of different freelancers concurrently–which is a much more efficient way of “testing” potential employees when you’re still in scaling mode. Now, having established that you’re looking for in freelancers (and not employees) during this phase of your business, where should you go to find them? Start with personal connections: people you know, referrals from people you trust, etc. Although there are fees to use these services, these sites streamline the process of finding new talent and getting them up and running. When time is of the essence, this is a good place to start. Freelancer, Upwork, Guru, and Toptal have proven themselves as reliables resources of talent. I’d suggest looking at LinkedIn first. You can either search through resumes and profiles or you can join WordPress communities where these job seekers are active. One of the things you’ll do during the evaluation phase is review applicants’ previous work samples. Why not beat them to the punch by finding them through their online portfolios? 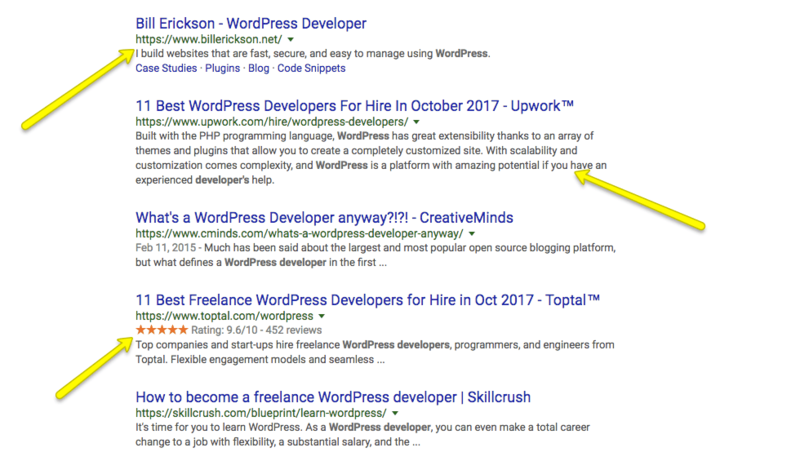 Search for terms like “WordPress writer for hire” (or something to that extent) and see what you come up with. This is also a great option if you want to hire local talent. I’m always surprised by how many people take the time to post responses to questions in online forums. What surprises me even more is the level of credentials some of these people have. So, if you spend a lot of time in forums like Quora, review WordPress-related questions and look further into who’s answering. You may be surprised by what you find. If you subscribe to WordPress blogs, take a closer look at the authors of the content as well as the people leaving comments. Many of these people are WordPress authorities and may even be in search of freelance work. Rather than turn to something like Craigslist or Indeed to hunt for new hires, I’d suggest looking at WordPress job boards. WordPress has one as do WPMU DEV and Smashing Magazine. How Do You Evaluate Freelancers for Your WordPress Business? At least three years’ experience with WordPress. Firm understanding of WordPress plugins, themes, and other third-party integrations. Owns and uses a stable dev/staging environment as well as a version control system like Git. Awareness of all things related to WordPress security, including core updates, plugin vulnerabilities, firewalls, CDNs, etc. Experience working in your targeted industry or niche. Photoshop fluency. InDesign and Sketch are optional. At least three years’ experience designing for WordPress. Familiarity with plugins and other third-party integrations. Fluency in WordPress themes. Understanding of responsive design, minimalism, and other modern design trends. Owns and uses design collaboration platform (like InVision). Knowledge of wireframing/prototyping, style guide creation, branding, color theory, typography rules, etc. Experience writing for your niche or extensive first-hand work experience within that field. Experience conducting research and developing outlines. Understanding of the WordPress content management system and how to create content within it. Should also know how to use SEO plugins to verify the optimization of their content (which they should’ve already done when writing it. Ability to create or use images to enhance content. Availability for revision work and open to feedback. Doesn’t necessarily need a degree in marketing and communications, but needs extensive experience as a marketer (at least three years). Understanding of modern marketing, SEO, and social media trends. Thorough understanding of what conversions are, with the ability to develop a strategy and process to gain them. Familiarity with WordPress as a marketing hub. Skilled in analysis: not just Google Analytics, but also A/B testing, heat map testing, eye-tracking studies, etc. Proven communication skills since they’ll be communicating with your team and clients. Ability to handle repetitive or monotonous tasks without any problem. Availability that matches your own, since they’ll serve as your right hand. Some knowledge of marketing, but not required. Some knowledge and experience with your industry. Ask for and review samples of their work to verify that it aligns with the style, voice, and quality you require. Read reviews and testimonials to get a sense for the common praise or criticisms this person receives. Whittle your list down to a few freelancers for the role you’re looking to hire. Then provide “test” assignments. I say “test” because it should be made clear to the freelancer that this is for the purposes of evaluation. However, the test should be done on a live project. Be ready to provide critique and real-time evaluation of their work. If you can’t lock it down with them during the evaluation phase, you can’t really expect them to learn it on the job. Pay attention to personality. It might not seem like a big deal, especially if they work remotely, but it is. Communication needs to be seamless as it moves from one department to another and clashing personalities can be very disruptive there. Also, consider availability. You might find someone amazing who lives overseas, but do you really want to wait until the next morning to find out they can’t handle a last-minute revision you sent the day before? Overall, this evaluation phase is meant to help you identify the best of the best talent. As you scale, you don’t want an unmanageable amount of freelancers moving in and out of your company. That’s inefficient, costly, and usually a sign you’re doing something wrong. Your goal, instead, should be to identify the best-fit people now who will continue to grow with you as your company does. Of course, that also means finding the right support for WordPress outside of your company, too. If you’re not currently talking to Pagely about managed WordPress hosting, add that to the list of things you need to do to round out your team.